It is hard to imagine today's casino deals without such fascinated game as Roulette. Each country has its variants of this game. Russian type of roulette, for example is called "Pole Chudes", it is different from European and American types of roulette. Almost all casinos have both types of roulette, however the mostly played is European one. 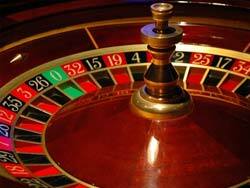 It is well-known that European version of roulette is very popular at Swiss casino. It can be explained by the fact that it has more advantages for player because of the absence of double zeros on the table layout as in American roulette. Nowadays everyone can practice on playing roulette either in real casino or in internet one. Online casinos offer free games and deposit bonuses, therefore majority of gamblers show their preferences to online gambling. It doesn't matter where to play roulette, its rules are the same in both types of casino. Rules of European roulette are very simple. Gamblers make their bets on some numbers, set of numbers or colors on the table layout. Croupier pronounces that there is no more bets can be made and starts spinning the wheel in one side and launches the ball on the upper border of the wheel in another. When ball will lend on some number, croupier proclaims the result, pays out winning amounts and takes away losing chips. There exist various types of bets, which have their payouts and probabilities. Odd or Even bet is made either on odd or even number. Red or Black. Is the same as odd or even and is made either on one color or another. Low or High. Numbers on the table are divided into two groups low which is 1 -18 and high 19-36. The bet is made on number from one of two groups. Dozen. There are three sets of numbers 1-12, 13-24, 25-36. The bet is made on one number from one of three sets. Columns. At the end of each column (there are 3 of them) from 37 numbers, there are boxes with words "2 to1". Player places his chips on one of these boxes, if the winning number is among these numbers he chose, the bet is winning in correlation 2 to 1. Straight-up is the highest bet because its payoff is 35 to 1. Player bets only on one number from 37. Street bet is made on 3 numbers by putting chips on the corner of the row. Corner bet. Chips are placed on the cross-point of 4 numbers. Square bet is made when chips are lying on the intersection on 0 and 3 on the corner. Player will win if one of four numbers 0, 1, 2, 3 drops.